I've just run the following using GATK v3.1. 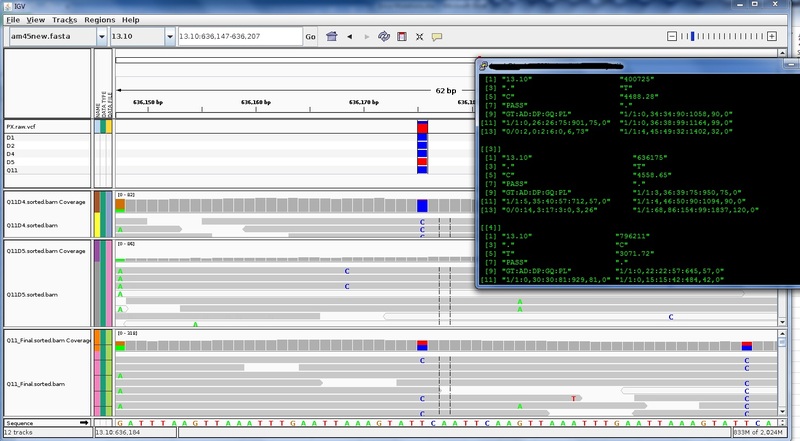 I then trimmed SNPs within 10bp of indels (called using the same but -glm indel). The samples therein represent a mother (Sample Q11) and her 4 haploid sons. I'm not sure what's going on here and was wondering if you could help out? It looks like the call is a little ambiguous, it's possible that some read biases pushed it over the line to hom-var. Have you tried running HaplotypeCaller instead of UG on the region? It is a much more advanced tool than UG. You can also try our genotype refinement workflow. Our primary tools are geared toward producing highly accurate variant calls (in the sense of detecting variation) but the genotype determination (between het and hom-var) can be further refined.